Do you dream of bringing your art and design to runways around the world? Do you strive to express yourself through modern design and unique, creative style? If so, then a career in the Fashion industry may be for you. A proper education can provide you with the skills you need to break in to this exciting industry. And don’t worry – no sewing is required for many fashion-related careers. What study fields can help me pursue a career in fashion? Fashion Design requires a passionate, creative pupil. You learn the basics of form, color, material, and technique in order to develop your personal vision as you work towards creating clothing and styling concepts. Looking for a school to study fashion design? Known as the “fashion design powerhouse,” Parsons, The New School for Design	is considered the best fashion design school in the US. With celebrity alumni including Donna Karan, Marc Jacobs, and Tom Ford, Parsons has proven to not only teach fashion design, but lead students into successful, rewarding careers as fashion designers. The Fashion Institute of Technology	is another notable fashion design school, also located in New York. Fashion merchandising and marketing experts are the driving force behind fashion, popularity, and culture. Programs in this field focus on consumer and design trends, the lifecycle of fashion products, and the fashion business as a whole. These fields also include Retail Management, Fashion Buying, Public Relations, and Advertising. Looking for a school to study fashion merchandising and marketing? Parsons, The New School for Design ranks very high with their Fashion Marketing program. Kent State University in Ohio also offers a top Fashion Merchandising program, including study abroad opportunities in Paris and Milan, and a garment center studio in NYC. Production managers run the front lines of fashion. They design the processes and schedules to turn raw materials into textiles, to turn textiles into clothing, to get clothing into retail stores, so that you can purchase and wear the latest trends that you see in magazines, movies, and on television. Managers in this fashion field find the most efficient ways to produce quality products at the lowest cost. This has many profound economic implications and is correlated directly with many current hot topics, like sustainability and green manufacturing and technology. Looking for a Production Management Degree? The Fashion Institute of Technology in New York City offers a Production Management degree that will help you master the product development process, and get you at the center of US fashion. If you are fascinated with the way fashion is made from start to finish, you should consider studying Production Management. Are you creative? Theatrical? Visual presentation and styling is an important aspect of fashion that many forget to consider. Exhibits, fashion shows, showrooms, store displays and windows are three-dimensional environments that bring fashion to life for audiences and consumers. Stylists work with advertisers, photographers, and directors to make clothing and models look good by researching inspiration, editing fabrics and silhouettes, arranging accessories, hair and makeup, and even music. Stylists have direct creative influence on the products they are presenting. Want to study Visual Presentation and Styling? The Academy of Art University in San Francisco offers a Masters of Fine Arts Degree in Visual Development. Plenty of graduate and undergraduate programs around the US offer programs that will leave you equipped with a portfolio of work that will enhance your professional opportunities in this exciting fashion field. How can I apply to a US fashion school? Applicants who are interested in transferring academic credits from non-US institutions must have their transcripts evaluated by credential evaluators such as World Education Services, or by another member of the National Association of Credit Evaluation Services. 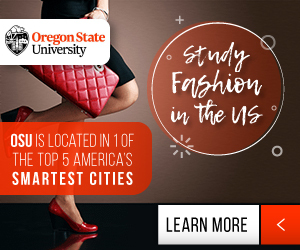 Fashion is an exciting career and the US has many great schools to choose from. Don’t miss your opportunity!